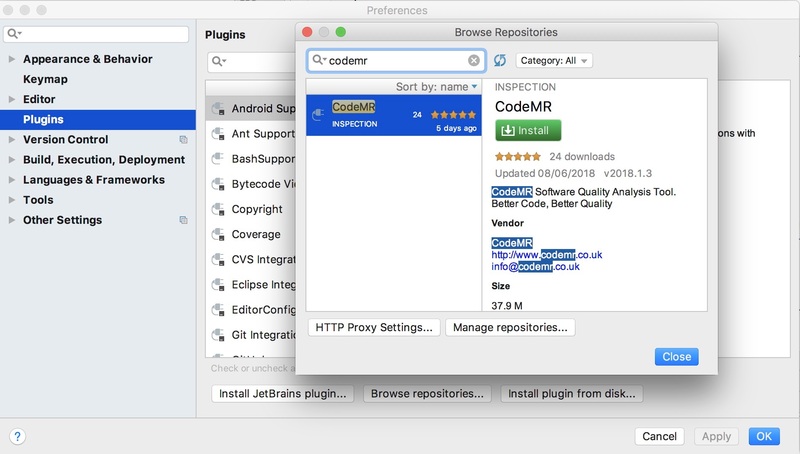 Search for CodeMR and click Install. Download CodeMR plugin to your local file system from CodeMR website or from IntelliJ Plugin repository site. 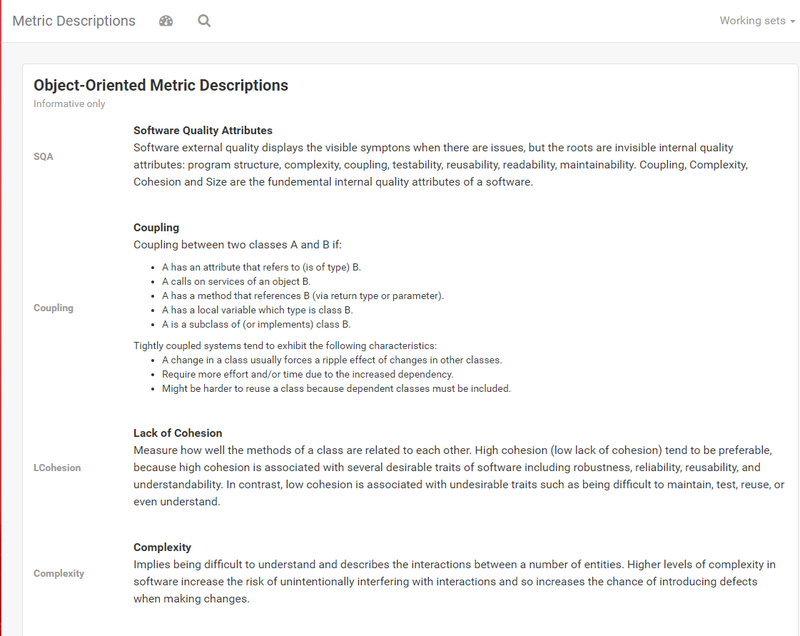 CodeMR is a software quality and static code analysis tool that helps software companies developing better code, better quality products. 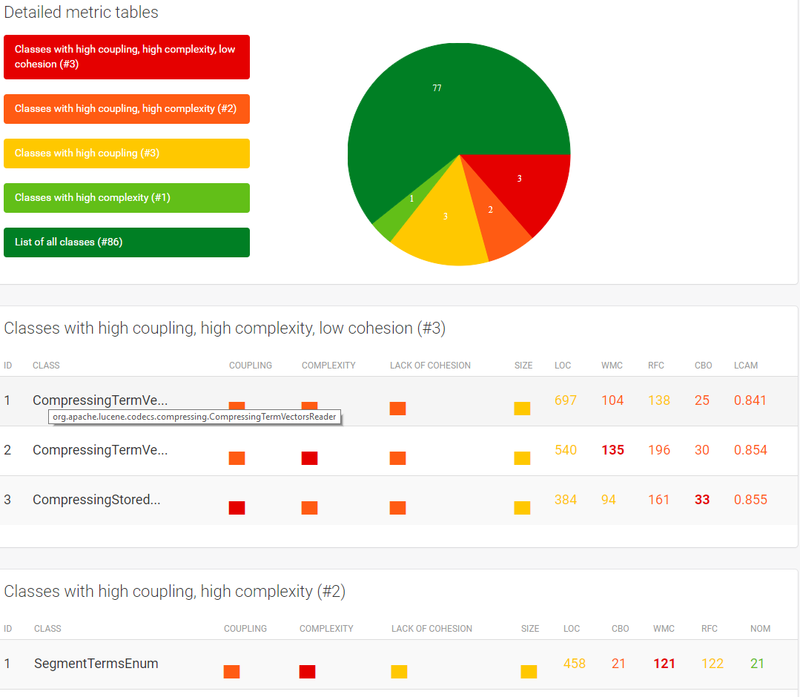 CodeMR visualizes code metrics and high level quality attributes (Coupling, Complexity, Size) for C++, Java and Kotlin and Scala projects in different views, such as Package Structure, TreeMap, Sunburst, Dependency and Graph Views. The graph visualization technique applied in CodeMR is simple yet intuitive. CodeMR has different filtering options and supports custom queries. 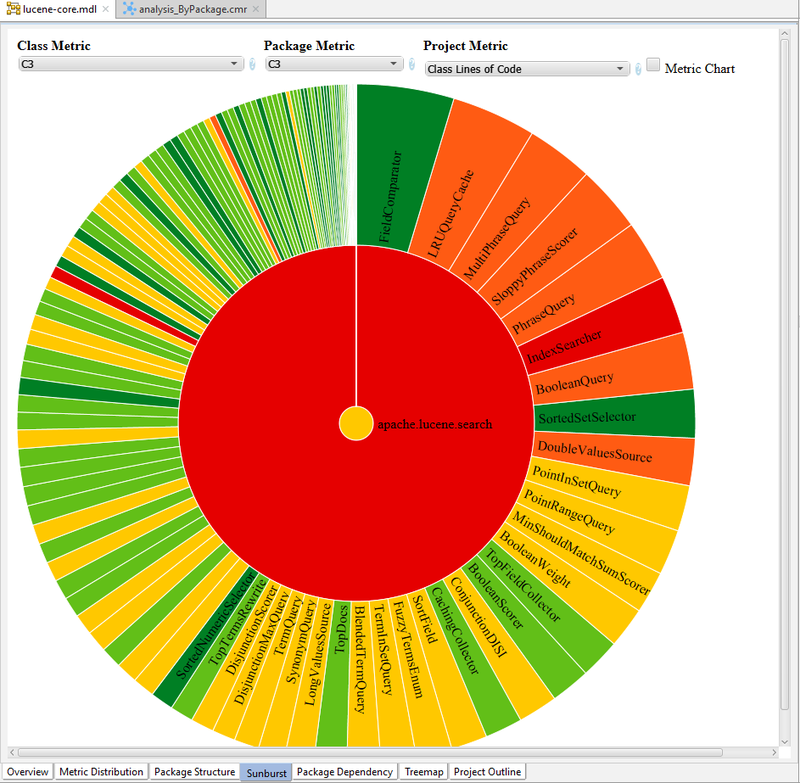 It visualizes high-level Object Oriented quality attributes and low level metrics. Quality attributes are derived from the combinations of several metrics. You can also create different HTML reports for the project. With Community Edition you can extract up to 50 source files and 60 classes. Model editor is the main entry point for the CodeMR analyze process. It displays different quality views of the project, also it allows you to create and edit working sets and graphs for the project. 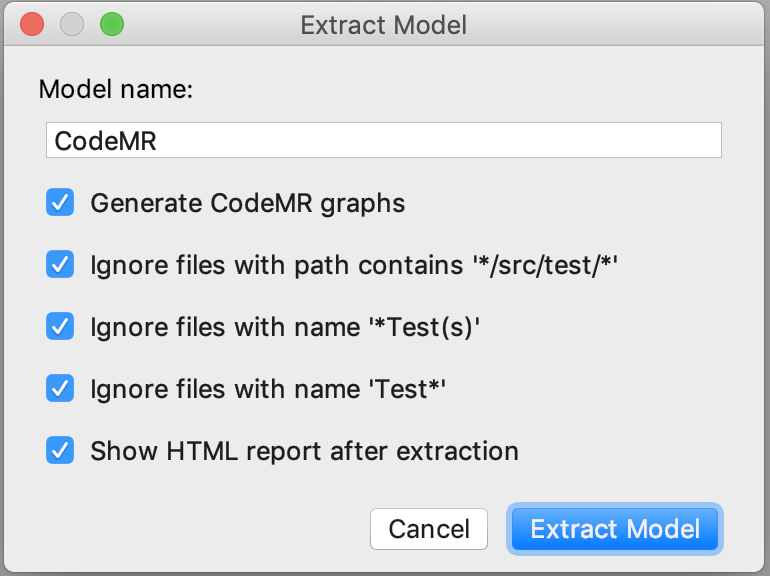 To create a CodeMR analysis model first select project, packages or files you would like analyze, then select Extract Model menu item from the CodeMR Menu. You can specify a name for the model and also select basic options for the model extraction. Once the tool finishes analyzing the software code, it will create a model file from the project and open this model in the CodeMR model editor. 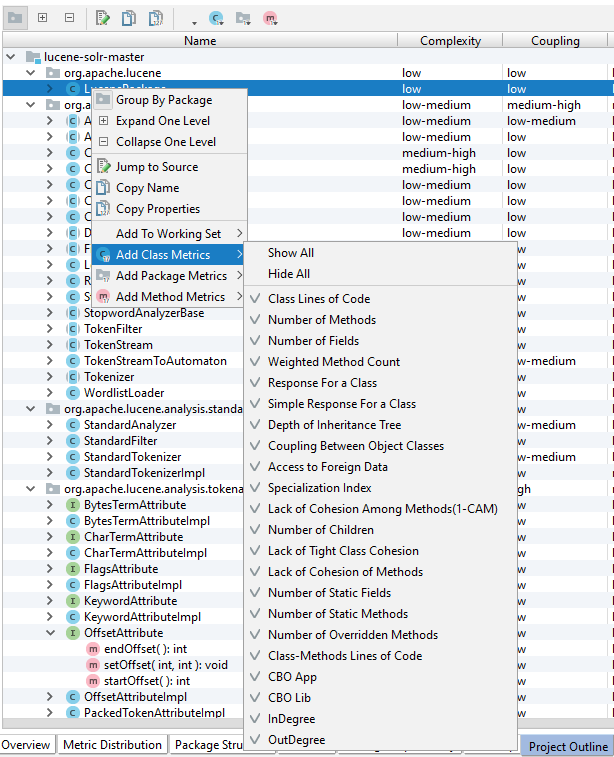 Overview Tab in the model editor gives general information about the extracted project such as total lines of code, number of classes, number of packages number of problematic classes, and number of highly problematic classes. Also, percentages of metric levels for the selected metric are illustrated in a pie chart proportional to the code size of classes in this level. 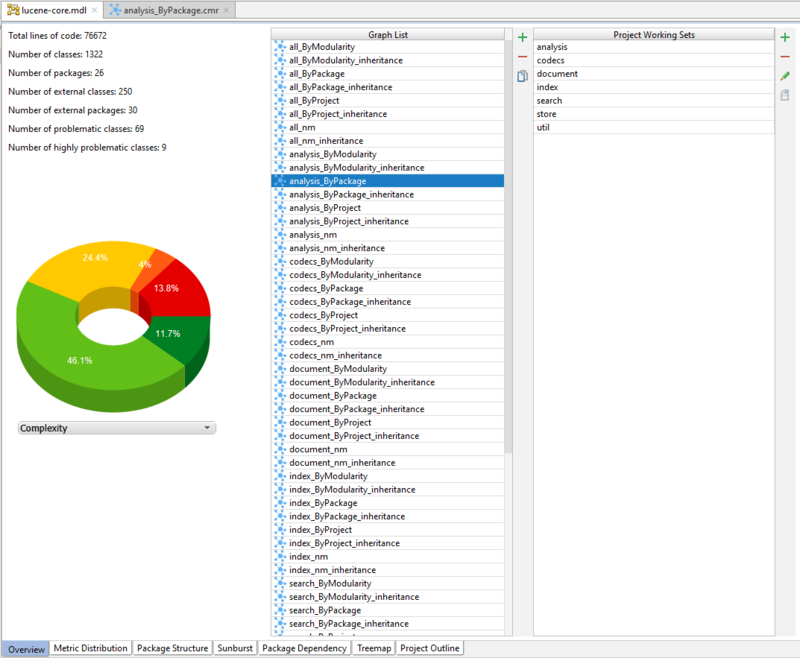 Overview Tab in the model editor also includes two important list: The graph list and the project working sets list. You can open graph in graph editor by clicking graph name in the list. 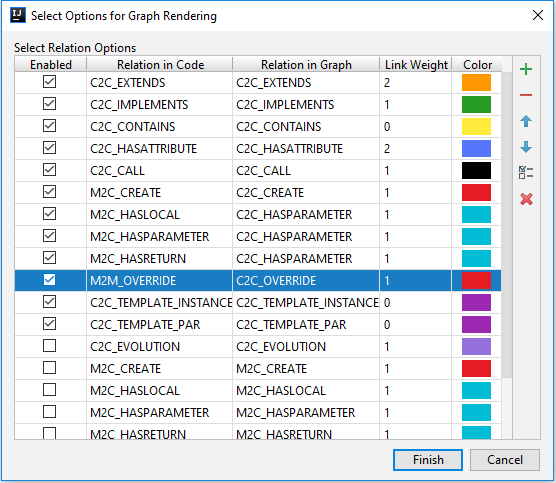 You can use rename option in the context menu to rename the selected graph. Working sets are used to divide big projects into smaller, more easy to analyze modules. If the project contains multiple Java modules, each module is automatically added as a working set in the extraction phase. User can also add new working sets. In the working set edit dialog, give a name to the working set and select packages and classes that you would like to add to the working set. add a new new working sets. remove the selected working set. generate HTML report for the project. 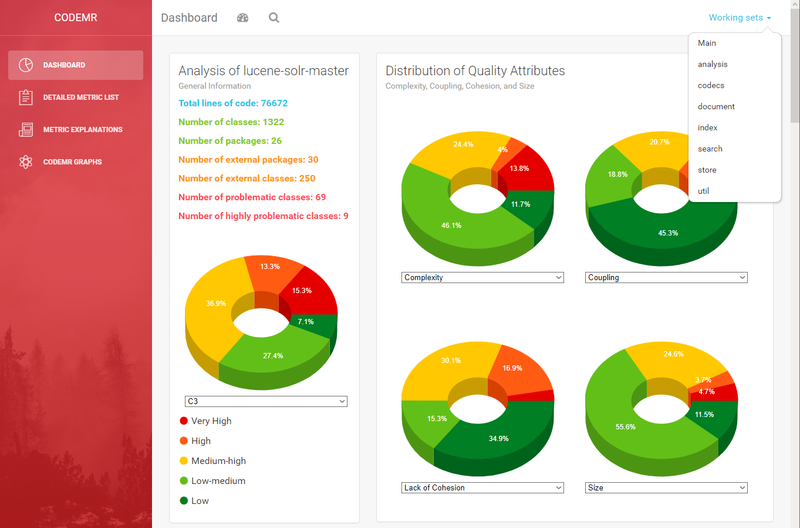 Metric Distribution Tab shows percentages of metric levels for the each metric in a pie charts. 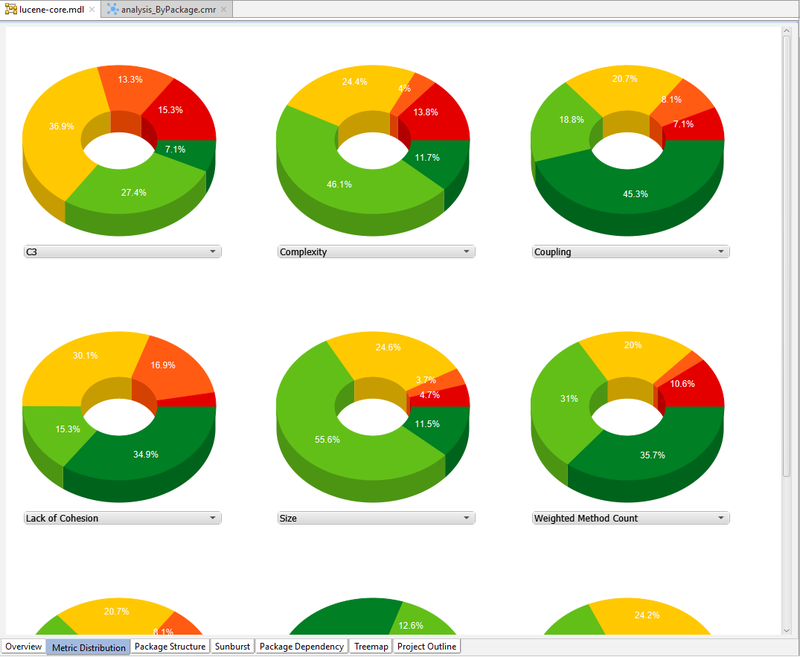 Slices of pie charts are proportional to the code size of classes for the corresponding level. CodeMR Metric Chart is used to indicate software metric values and metric levels in an intuitive way. Each metric bar is scaled to its predefined range, and metric bar is colorized according to the level thresholds of the selected metric. Following are the examples of class metric chart of a class and metric chart of a method respectively. Metric Chart are available in the the CodeMR metrics tool window and insides several views in model editor. Size of each circle is proportional to the size of the represented software entity. Color of each circle represents the level for the selected metric. If Metric Chart option is selected when you hover the class you can see its metrics in CodeMR Metric Chart. It is zoomable, you can change the zoom level by clicking the circles. angle of each arc is proportional to the size of the represented software entity. Color of each arc represents the level for the selected metric. It is zoomable, you can change the zoom level by clicking the arc. Area of each rectangle is proportional to the size of the represented software entity. Color of each rectangle represents the level for the selected metric. It is zoomable, you can change the zoom level by clicking the rectangles. 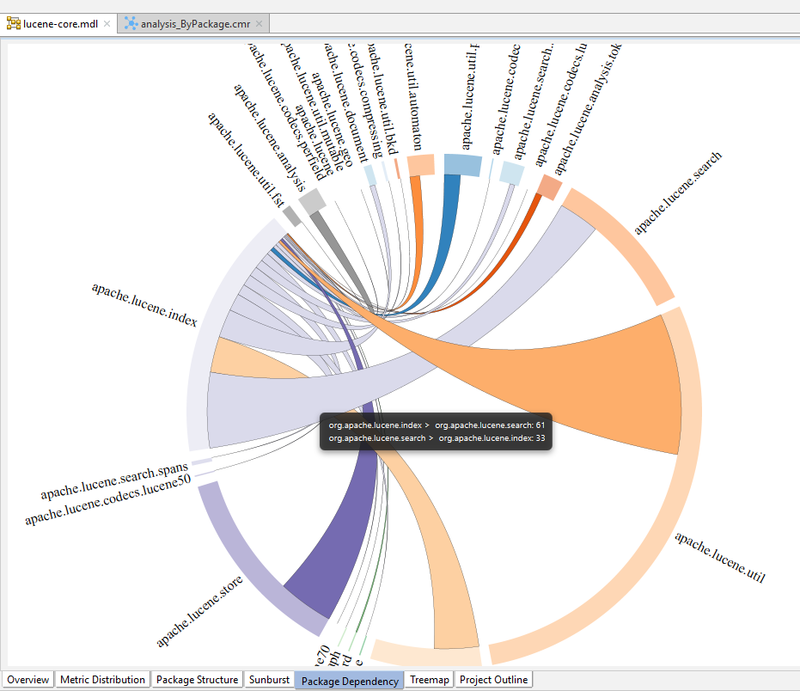 Package Dependency view arranges the packages radially, drawing thick curves between nodes. The thickness of the curve encodes the frequency of relations between two packages. If a chord is tapered, there are more relations from a given package than to it. You can see the number of relation in the tool tip if you hover the chord between packages. 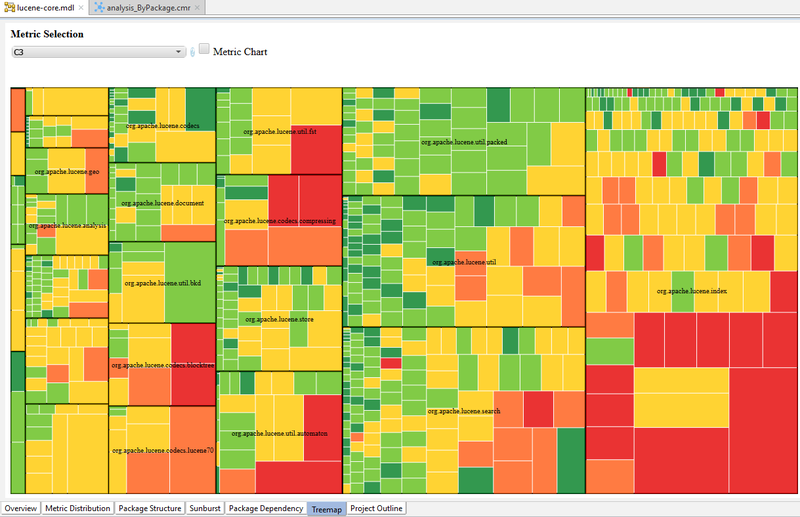 Outline view shows quality attributes and metrics of software elements in a structured tree table. 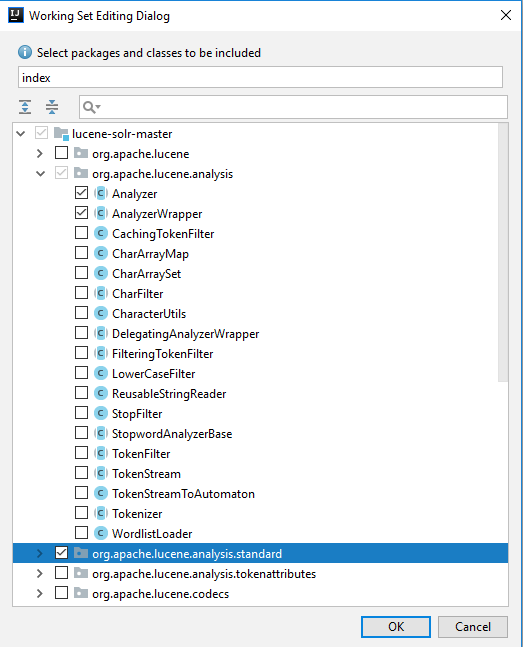 You can sort elements by column of different metrics and quality attributes and see the most problematic elements quickly and jump to source code of selected element. Jump to source of the selected element. Copy name of the selected element(s). Copy properties of the selected element(s). Select class metrics to show/hide in the table. 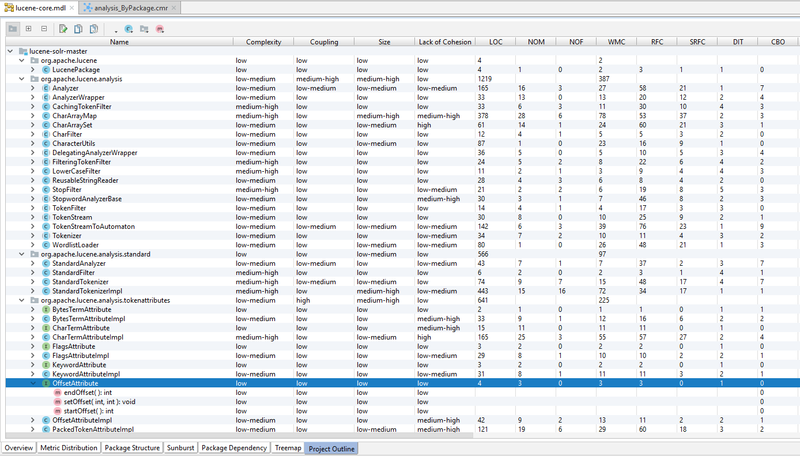 Select package metrics to show/hide in the table. Select method metrics to show/hide in the table. 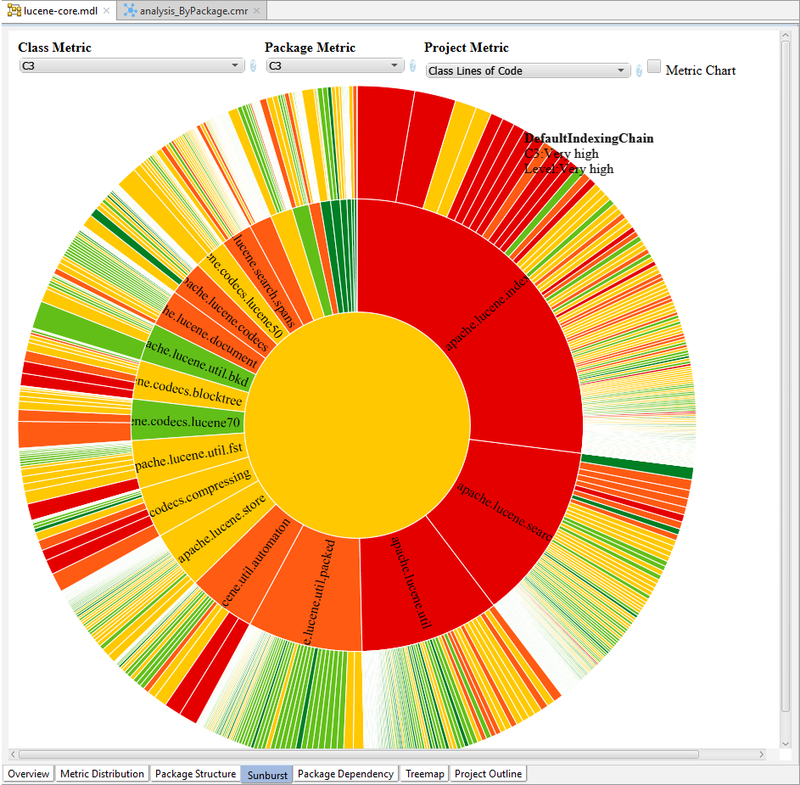 CodeMR main tool window has several views to allow users interact with the graph. 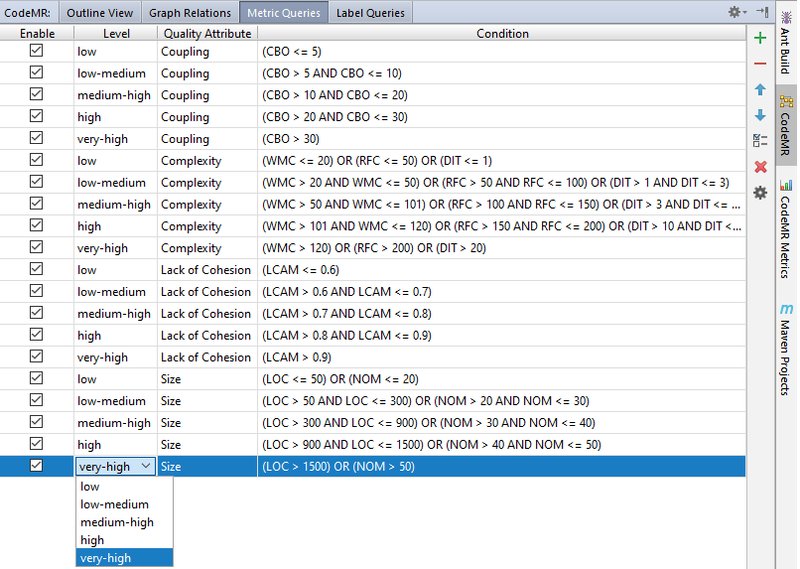 Group elements in the outline table by the modules in the graph. Refresh elements in the outline table by the elements in the graphs. Remove selected elements from the graph. Highlight selected elements in the graph. After drawing a graph you can still change the edge display options from the graph relation views. 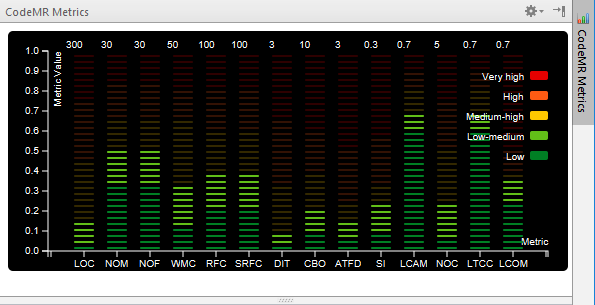 CodeMR Metrics tool window shows metric values and level of selected software entity. Metric Chart is used to indicate software metric values and metric levels in an intuitive way. Each metric bar is scaled to its predefined range, and metric bar is colorized according to the level thresholds of the selected metric. Graph Editor let you edit graphs for the project. When you select and double click a graph in the model editor, this graph opened in the Graph Editor. When you click draw graph button on the graph editor, it launches the graph rendering wizard to customize graph rendering options. 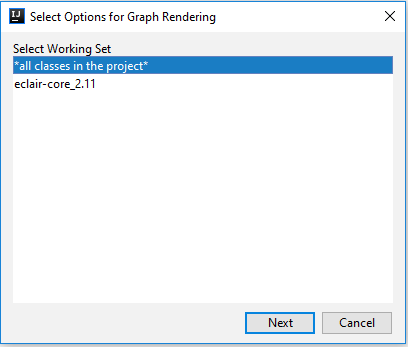 First you should determine the subset of project classes to display in the graph you can select one of project working set (defined in the model editor) or the whole project. After that you can choose a grouping option to display a more modular graph and easy to understand graph. In the last stage, you can select how relations in the source code will be reflected in the graph. You can filter only some relations,also assign different weights and colors to the edges representing those relations. In case there are more than one relation between two classes, all types of relations can be seen from the edge label or the tool tip of the edge. However, for the sake of simplicity, the color of edge is determined by relation type with the highest priority. Multiple element selection: use control, shift or cmd modifiers key down and left mouse button to select multiple element in a rectangle area selected by mouse. Delete selected elements: delete or escape key. Package: classes of the same package are grouped in the same module. Clean: no group for all classes. Authoritative: grouping are manually given by the user. Fast Community: Graph automatically grouped by fast community modularization algorithm. CodeMR can generate HTML reports for the project. You can easily generate HTML report by selecting working sets and clicking generate report button in the working set toolbar of model editor. Reports are generated for the whole project and also for each working set. You can navigate between working sets via “working sets” menu on the top-right corner of the page. HTMl report consists of four parts. The Dashboard, Detailed Metric List, Metric explanations, and Graphs. 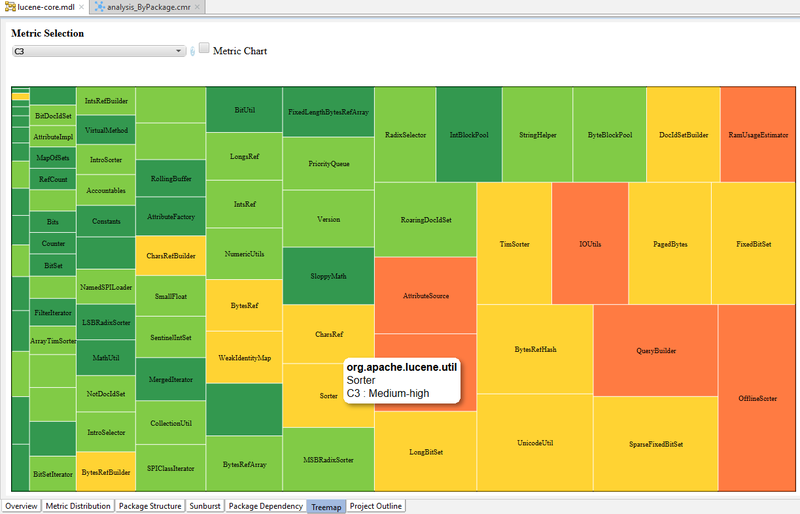 Dashboard part is very similar model editor in the IntelliJ IDE. it contains, general information, distribution of quality and metric attributes, and also, sunburst, package structure, treemap and package dependency charts. 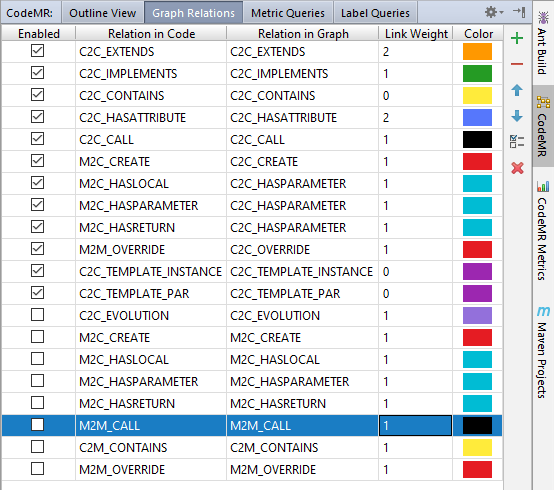 Detailed metric tables part list classes and their metric values in different tables according to their quality level. Metric Explanations part is the description of used metrics in the report. You can also get more information about a metric, by clicking question mark icon next to the metric selection combobox. It will show up a tooltip displaying scope, description, related quality attributes and thresholds of the selected metric. If you click more information link, it redirects you to the metric explanation page. 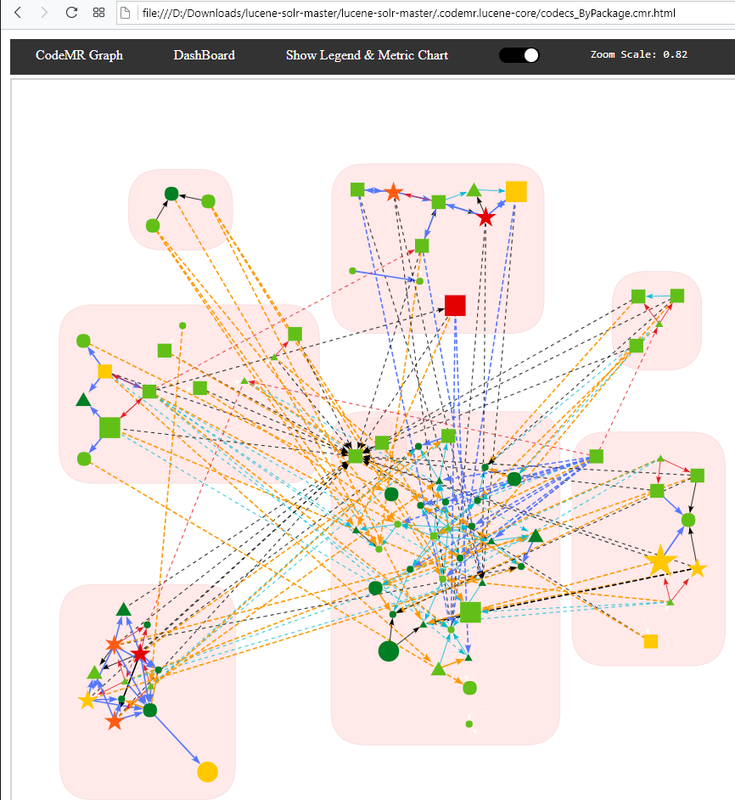 Graph part displays the list of graph generated with CodeMR. By clicking the graph you can see and edit graphs in HTML form. Software external quality displays the visible symptoms when there are issues, but the roots are invisible internal quality attributes: program structure, complexity, coupling, testability, reusability, readability, maintainability. Coupling, Complexity, Cohesion and Size are the fundamental internal quality attributes of a software. A has an attribute that refers to (is of type) B. A calls on services of an object B. A has a method that references B (via return type or parameter). A has a local variable which type is class B. A is a subclass of (or implements) class B. A change in a class usually forces a ripple effect of changes in other classes. Require more effort and/or time due to the increased dependency. Might be harder to reuse a class because dependent classes must be included. 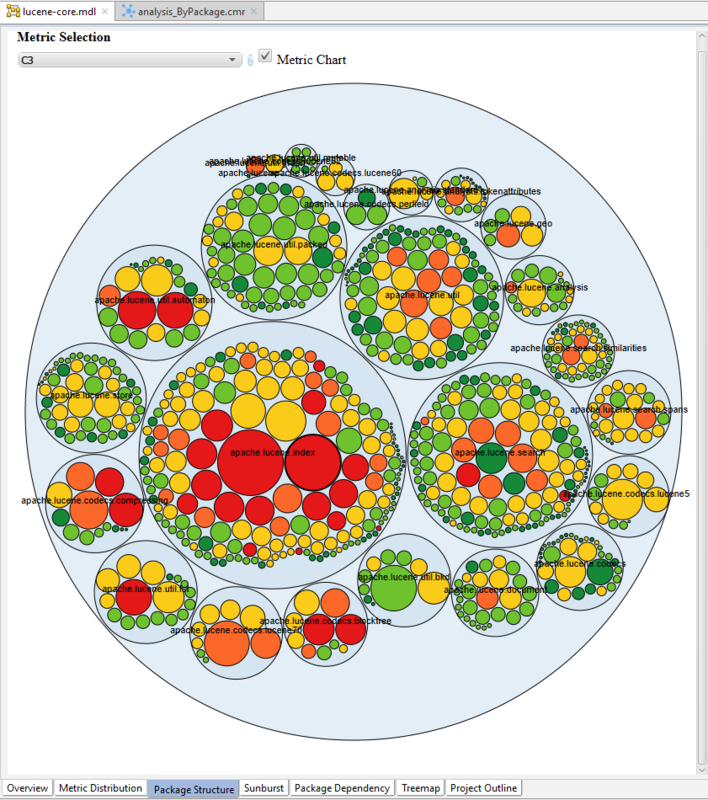 Measure how well the methods of a class are related to each other. High cohesion (low lack of cohesion) tend to be preferable, because high cohesion is associated with several desirable traits of software including robustness, reliability, reusability, and understandability. In contrast, low cohesion is associated with undesirable traits such as being difficult to maintain, test, reuse, or even understand. Size is one of the oldest and most common forms of software measurement. Measured by the number of lines or methods in the code. A very high count might indicate that a class or method is trying to do too much work and should be split up. It might also indicate that the class might be hard to maintain. The number of all nonempty, non-commented lines of the body of the class. 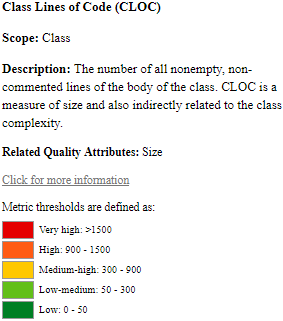 CLOC is a measure of size and also indirectly related to the class complexity. The weighted sum of all class’ methods an represents the McCabe complexity of a class. It is equal to number of methods, if the complexity is taken as 1 for each method. The number of methods and complexity can be used to predict development, maintaining and testing effort estimation. In inheritance if base class has high number of method, it affects its' child classes and all methods are represented in subclasses. If number of methods is high, that class possibly domain specific. Therefore they are less reusable. Also these classes tend to more change and defect prone. The position of the class in the inheritance tree. Has 0 (zero) value for root and non-inherited classes.For the multiple inheritance, the metric shows the maximum length. Deeper class in the inheritance tree, probably inherit. Therefore, it is harder to predict its behavior. Also this class relatively complex to develop, test and maintain. The number of direct subclasses of a class. The size of NOC approximately indicates how an application reuses itself. It is assumed that the more children a class has, the more responsibility there is on the maintainer of the class not to break the children's behaviour. As a result, it is harder to modify the class and requires more testing. The number of classes that a class is coupled to. It is calculated by counting other classes whose attributes or methods are used by a class, plus those that use the attributes or methods of the given class. Inheritance relations are excluded. As a measure of coupling CBO metric is related with reusability and testability of the class. More coupling means that the code becomes more difficult to maintain because changes in other classes can also cause changes in that class. Therefore these classes are less reusable and need more testing effort. The number of dependent library classes. The number of dependent classes in the application. The number of the methods that can be potentially invoked in response to a public message received by an object of a particular class. 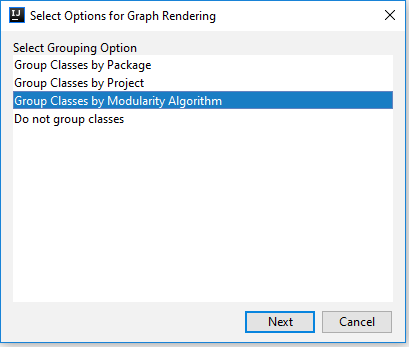 It includes the full call graph of any method called from the originating method.If the number of methods that can be invoked at a class is high, then the class is considered more complex and can be highly coupled to other classes. Therefore more test and maintain effort is required. The number of the methods that can be potentially invoked in response to a public message received by an object of a particular class. It includes methods directly invoked from the class. If the number of methods that can be invoked at a class is high, then the class is considered more complex and can be highly coupled to other classes. Therefore more test and maintain effort is required. a number of variables (attributes) in class. a contains all variables whether shared (static) or not. LCOM3 varies between 0 and 2. Values 1..2 are considered alarming. In a normal class whose methods access the class's own variables, LCOM3 varies between 0 (high cohesion) and 1 (no cohesion). When LCOM3=0, each method accesses all variables. This indicates the highest possible cohesion. LCOM3=1 indicates extreme lack of cohesion. In this case, the class should be split. The number of methods in a class. The number of static fields in a class. The number of static methods in a class. Defined as NORM * DIT / NOM. The Specialization Index metric measures the extent to which subclasses override their ancestors classes. This index is the ratio between the number of overridden methods and total number of methods in a Class, weighted by the depth of inheritance for this class. Lorenz and Kidd precise : Methods that invoke the superclass’ method or override template are not included. Total number of all nonempty, non-commented lines of methods inside a class. Outgoing Coupling. The number of classes in other packages that the classes in the package depend upon is an indicator of the package's dependence on externalities. Incoming Coupling. The number of classes in other packages that depend upon classes within the package is an indicator of the package's responsibility. Total number of Interfaces and classes. The number of Overridden Methods. The Lack of Tight Class Cohesion metric measures the lack cohesion between the public methods of a class. That is the relative number of directly connected public methods in the class. Classes having a high lack of cohesion indicate errors in the design. ATFD (Access to Foreign Data) is the number of classes whose attributes are directly or indirectly reachable from the investigated class. Classes with a high ATFD value rely strongly on data of other classes and that can be the sign of the God Class.